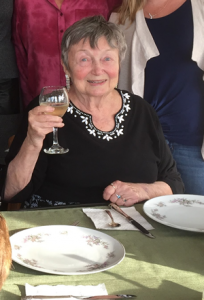 Gloria June (Boutilier) Norcott, 87, of Gorham, NH. died peacefully on March 16, 2019. She was a lifelong resident of the Berlin-Gorham area and was active in many civic organizations. She loved skiing and fishing with her sons and even went tuna fishing with Gary a time or two. She took great pride in her grandchildren and enjoyed spending time with her great-granddaughter. She is survived by her son, Gary Jacobs, daughter-in-law, Linda Jacobs, Grandson and his wife, Nathan and Danielle Jacobs, Granddaughter, Erin Jacobs, and great-granddaughter, Kylie Jacobs-Carr. She was predeceased by her parents, Melberry and Alfreda Boutilier, her brother, Melberry Boutilier, Jr., her son, Derek Jacobs, and her husband, Kendall Norcott.